Hello!!! I wanted to post real quickly the video tutorial I did this afternoon on making a multicolored flower using Distress Inks, and my new Stampin' Up goodies!! Here is my finished card with that same flower, and video to show you how I did it. Enjoy!!! Stampin' Up! stamp set "Mixed Bunch"
Stampin Up! 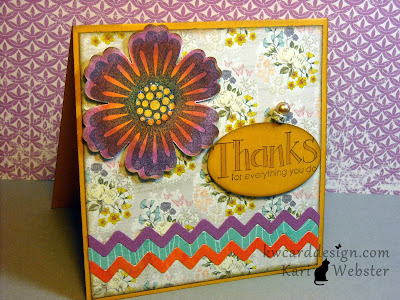 stamp set - " For Everything"
Card Base - More Mustard - Stampin' Up!